CLEANING AND LAUNDRY INCLUDED IN THE PRICE. This three bedroom luxury south facing duplex, covering two floors with three patios, offers all day sunshine. The entrance to the 3 bedroom apartment is located up a number of steps - there is a small gate which opens up onto the large outdoor dining terrace and entrance to the main living accommodation. (see exterior photo). Parking is available for 2 cars either directly by the apartment or within one of the the private car parks, approx 20yds away. 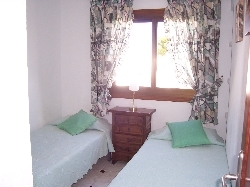 We also own the 2 bedroom ground floor apartment situated directly undereath the 3 bedroom (see photo) which can be booked seperately or both apartments can be booked to cater for large families wanting to holiday together but live separately. Both units = 5 bedrooms. Contact the owner for more details. 1ST FLOOR offers a large spacious lounge and dining area. The air conditioned lounge has two sofas and satellite/cable TV, playing BBC and ITV channels. 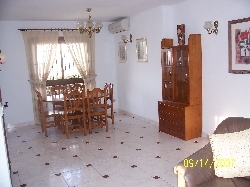 The separate dining area has a large dining table and 6 chairs. Leading from the lounge is the kitchen area which is fully equipped to cater for 6 people, also there is a separate utility room which offers a washing machine, sink and clothes drying area. as well as a toilet/ shower room which includes a shower cubicle with a sink basin and WC. Leading from the lounge is an exceptionally large outdoor sun terrace which offers all day sun. 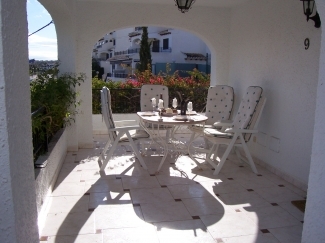 There is a large marble dining table and 6 chairs + built in barbeque for alfresco dining. There is also a large grill which can be plugged into an outside socket to grill steaks/fish etc on the terrace (for if you dont want to light the barbeque). 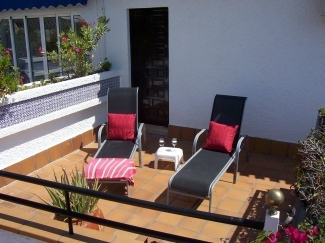 The property is on a corner plot so has an abundance of space - a 2nd sun terrace leads on from the outdoor dining area which is south facing so catches all day sun. SECOND FLOOR. Comprising of three bedrooms, the master bedroom with double bed, fitted wardrobes and air conditioning. Window shutters opens onto the 3rd sun terrace.which is south facing and a sun trap for sun worshipers. The second bedroom has air conditioning, built-in wardrobes and twin beds, the third bedrooms has twin beds, built-in wardrobes and is cooled by fans. A cot can be included if requested. The main bathroom has a shower, bath, WC, bidet and hand wash basin. 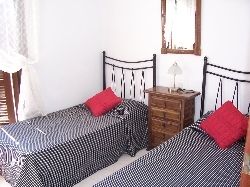 A cot can be hired at a cost of �10 per booking. This apartment does not cater for groups of youths. PLEASE VIEW THE UP-TO-DATE CALENDAR AT THE BOTTOM OF THE PAGE FOR AVAILABILITY TO MAKE SURE THE DATES YOU WANT ARE FREE BEFORE FILLING IN THE CONTACT FORM. 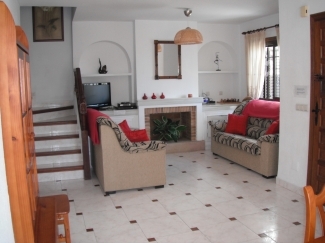 Our apartment in the Los Angius V complex is situated in an exclusive residential area. The boating marina adjacent to the beautiful Cabo Roig beach is within 500 yds just at the end of our street . A small childs playground is located at the beach end of our street. The privately owned complex has mature gardens and two large swimming pools, we do not overlook the pool but the nearest pool is within 50yds- there is one road into the complex which is manned by an automatic gate. The area has numerous restaurants and supermarkets all within a 10 minute walk which allows for a great night out after which you can return to our complex and leave the nightlife behind. The Strip is where it is all happening, the place for evening entertainment where there are Spanish, Italian, Chinese, Indian, German and English restaurants and numerous bars all open until late. 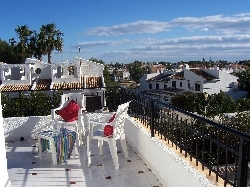 Just a short journey away by car or taxi is the plaza at Villamartin with over 20 bars and restaurants situated in a picturesque square near the golf course. 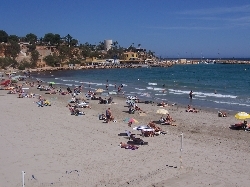 Cabo Roig is referred to as the jewel of southern Costa Blanca and is eclipsed by EEC blue flag beaches and coastal walkways. 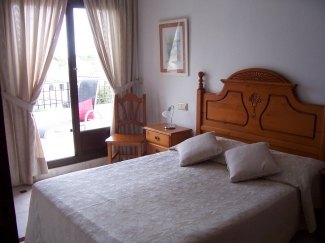 Situated 45 minutes South of Alicante Airport and 20 minutes North of Murcia Airport. The nearest beach is within 500yds and all the beaches are cleaned each morning. Apart from sunbathing the nearest beach offers sailing, scuba diving fishing and water skiing all next to a beautiful marina. The beautiful costal walkway is a must do and stretches for miles above the beaches passing natural coves, ideal for a relaxing scenic walk or an energetic jog or cycle. With 300 days of sunshine and warm temperatures this location is ideal for couples, families or golfers seeking an active or relaxing holiday. The Murcia area is becoming very popular with golfers as there are 17 superb golf courses within 30 minutes drive and several more under construction. Three courses are within 10 minutes of Cabo Roig. Campoamor is situated in two valleys with magnificent views and a beautiful clubhouse, Villamartin has an abundance of olive trees and well placed bunkers to make it a challenging course for players of all abilities and Las Ramblas is stunning but a short course and is challenging with high trees, natural fairways and ravines feature strongly. La Finca is 15 minutes drive where a new clubhouse has been built to serve the Spanish Open and La Marquesa is close by. Roda golf is highly recommended, is 15 minutes away and very popular with it�s signature 7th island green par 3 surrounded by water a must for golfers of all standards. The Nicklaus Trail provides various types of course from desert to parkland and other courses such as La Peraleja constructed by Seve Ballesteros has some excellent par 3�s. La Manga is 30 minutes away and has 3 championship courses to play. (Pre-booking your tee-off times is advisable - at some courses a handicap certificate is required). Golf clubs and buggies can be hired. Early Booking discount of 5% if start date is greater than 9 months away. Late booking discount - 10 % discount if booking start date is less than 14 days of booking date. Long stay discount of 20% if booking is more than 4 weeks. Long stay discount of 25% if booking is more than 8 weeks. Electric meters - meters are set to allow free electric usage of �15 per week. This is a generous amount and should cover normal usage for a weeks stay. We have not installed meters to make money but to ensure careful use of the air conditioning. However if guests wish to leave the air conditioning on all day additional meter cards may be required and can be purchased via the on-site manager for �5.